Next post: Now that’s a book. “Postcards from the Imaginary Mom” is her account of a book tour. “Four days out,” she writes, “and I’m hard pressed to remember where I’ve been.” The tour ends with her locking herself out of her hotel room, dressed only in T-shirt and cowboy boots, and receiving aid from a dignified, silver-haired matron in the hallway, who then, of course, appears in the front row at that evening’s event. 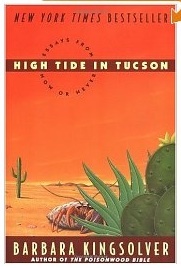 Alarming, amusing, always interesting and very well written, Barbara Kingsolver’s High Tide in Tucson sets the standard for the personal essay. I live in Tucson…the book is listed in my local library at two locations but “not available”…? If you liked these essays, you’ll love Small Wonder. Big Kingsolver fan. I bailed on Pam Houston for this one.